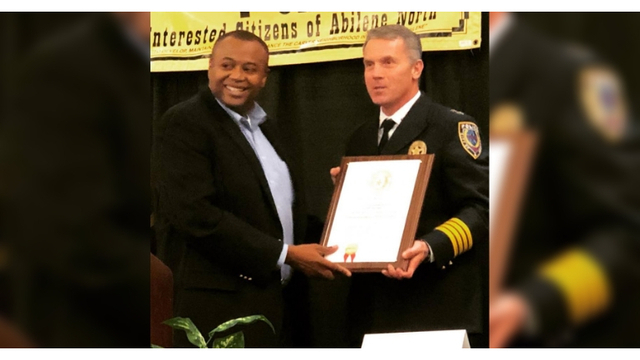 ABILENE, Texas (KTAB/KRBC) - Abilene Police Chief Stan Standridge has been honored with the Hero Award from Interested Citizens of Abilene North (I-CAN). Mayor Anthony Williams presented Chief Standridge with the award at the I-CAN luncheon. Standridge issued the following statement about receiving the award. "This award is a direct reflection of the daily efforts of our Police staff, sworn and civilian. I am convinced of this truth: for this City to be successful, its Police Department must be successful. We are linked, precisely because “we” are community. I work very hard to be inclusive. I echo our Mayor’s belief that people need a seat at the table. The issues facing us are huge and require authentic partnerships. You will see such partnerships in our alliance to end domestic violence, our homelessness initiatives, our radical changes to mental health response and crisis prevention, our Child Advocacy Center, and the increasing use of technology to enhance efficiency. I-CAN is a group of dedicated leaders who believe they can make a difference. So is your Police Department, and we are committed to working alongside our neighbors to bring about change, one family at a time."